For the past several months with the generous help and inspiration of Mira Talbot-Pope, I have been getting Spanish translations of articles by Benjamin D. Paul up on the web in the Histories section. Several of these articles were written in the 1940s and 50s, thus they are some of the best documents on how things were at that time. These Spanish translations will help the Maya youth of San Pedro know some of the history of their town. Changes have come quickly to San Pedro recently with the easy availability of cell phones, televisions and computers. For the first few years I visited San Pedro, there was one phone for the entire town, now every person under the age of thirty has a cell phone. The community of foreigners in San Pedro has expanded many times what it was when I first came there in 1985 (about 10 people), and includes both those living there and those attending one of the Spanish schools (the count I last heard was 14 schools). 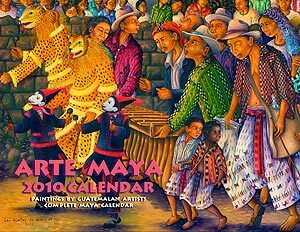 The 2010 Arte Maya calendar is now out. It is in both English and Spanish. The calendar includes photographs and biographies of the twelve Maya artists whose paintings appear in the calendar. The calendar includes three women artists—two Tz'utuhil and one Kaqchikel women. Paula Nicho Cumes’s painting from the calendar is featured in the heading for this newsletter (above left). The front cover is a detail of one section of a triptych by Pedro Rafael Gonzalez. 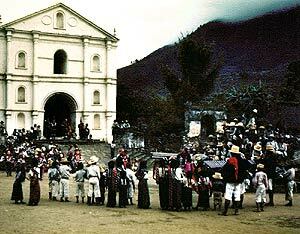 The subject of the triptych is a procession in San Pedro la Laguna in around 1950. 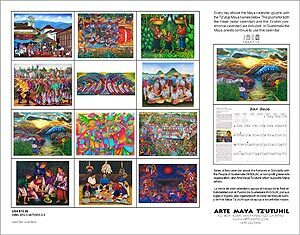 In addition to the normal Gregorian calendar, the 2010 Arte Maya calendar includes the complete Maya calendar with the day glyphs for both the tolkin (ceremonial calendar) and the haab (solar calendar). This is the eighth year of the calendar and the fourth year for the Maya glyphs. The Maya calendar is the same as the one used by the Maya priests in Guatemala today. The Arte Maya website now has a page in the Histories section explaining how the Maya calendar works. A lot of wild speculation about what will happen on December 21, 2012, when the current Maya calendar ends. Much of it is by people who know little about the Maya or the Maya calendar. 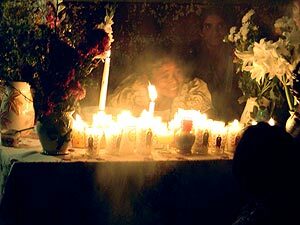 Arte Maya is in the process of contacting Maya spiritual leaders and scholars of the Maya religion to comment on what the Maya really believe. We will be posting their ideas about 2012 in the Histories section of the website. This page is just at the beginning stage. We will be adding comments as they receive them. We are also planning a special calendar for 2012 where each artists creates a painting about the Maya calendar and 2012. Recently Arte Maya has not had any paintings by Mariano Gonzalez Chavajay or Antonio Vasquez Yojcom for sale. Since the last newsletter five paintings by Mariano and ten paintings by Antonio have been posted on the website. Mariano Gonzalez Chavajay is the most well known of the artists of San Pedro la Laguna because of his ability to paint exquisitely detailed paintings of the lives of the Tz'utuhil Maya. Antonio Vasquez Yojcom is from San Juan la Laguna, and from the generation of Maya painters who learned from los hermanos Gonzalez Chavajay—Mariano, Matías, and Pedro Rafael. 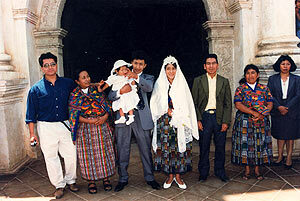 Antonio studied for around six months in the early 1990s with Pedro Rafael Gonzalez Chavajay. 30% off on paintings by Maria Elena Curruchiche, Jose Antonio Gonzalez Escobar, and Maria Teodora Mendez de Gonzalez. 20% off paintings by Domingo Garcia Criado, Diego Isaias Hernandez Mendez, Mario Gonzalez Chavajay, and Vicenta Puzul de Gonzalez. December is also my busiest month. I work a forty hour a week job in December (the job that pays for my work with the artists) in addition to all my regular work with Arte Maya and all the orders of the busiest month. Therefore the sooner you get your order in (calendars or paintings), the better for both you and me. A number of years ago I decided to branch out a little and I acquired a number of serigraph and lithograph prints by Carlos Merida. I have since decided this is a mistake because of the investment of money. I would rather be investing this money in helping the living Maya artists. Therefore, I am offering all Carlos Merida prints at 50% off, and I will reinvest any money earned in the Maya artists. 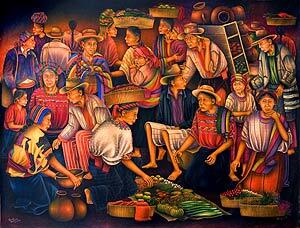 Carlos Merida is probably the most famous artist from Guatemala. 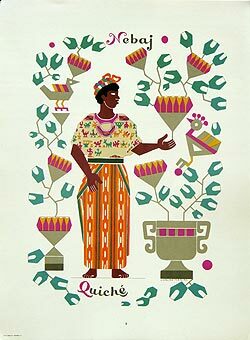 During the 1940s and 1950s did several series of prints of the traje (traditional dress) of the Indians of Guatemala and Mexico. I have read that in recent years Carlos Merida's work has increased more in value than any other Latin American artist except Frida Kahlo. These prints were printed in editions of 1,000. When anthropologist Benjamin Paul visited San Pedro la Laguna for the first time in 1941, it was a village of around 4,000 people (photo left). Ben and his wife Lois kept on traveling to and writing about San Pedro la Laguna as long as they both lived. In the past few months, Spanish translations of this articles on the web have been posted in the Histories section (they were already posted in English). Additionally, an article on Sibling Rivalry that he wrote in 1950 has been newly posted in both English and Spanish. Many things have changed since then, and the article documents some of the interesting Maya beliefs in San Pedro at the time. We hope eventually to have posted all the articles (in both Spanish and English) that Ben and Lois Paul wrote about San Pedro. When anthropologist and weaver Margot Blum Schevill travelled to the Maya village of San Antonio Aguas Calientes in 1978 to learn weaving, she began a relationship with her teacher's family that would continue until the present day. In the Histories section the one can read the first chapter of the story of Edgar, the son of her teacher. Edgar's story, of which we hope to ultimately publish all, tells of the life of his family in Guatemala, and how he came to the United States. We have the Margot's journal of her first day of meeting the family and beginning weaving. Kathleen Vitale of Endangered Threads Documentaries in her third video: Manuela & Esperanza: The Art of Maya Weaving tells the story of two accomplished Maya weavers, Manuela Canil Ren of Chichicastenango and Esperanza Pérez of San Antonio Aguas Calientes . The video follows them as they weave traditional blouses (huipiles) in less than three months. The weavings done in San Antonio Aguascalientes use among the most difficult weaving techniques, the double sided brocade. In addition to seeing how these two different weavers set up their looms, do the weaving, and finish the huipiles, we are able to share the generous spirit of these two very different Maya weavers. Cynthy Johnson has been working for the past several months arranging for a exhibition of the paintings of Lorenzo Cruz Sunu, a Tz'utuhil Maya artist from San Pedro la Laguna. Lorenzo's brother Pedro Cruz Sunu, who for the past several years has been promoting the art of Lorenzo and other Tz'utuhil Maya artists, is in the Saint Paul Minnesota area to talk about the paintings and how they represent traditional Maya culture and traditions. Pedro Cruz is one of the people from San Pedro who can best convey their culture and traditions in words, and his visit has caused quite a sensation from what I hear. 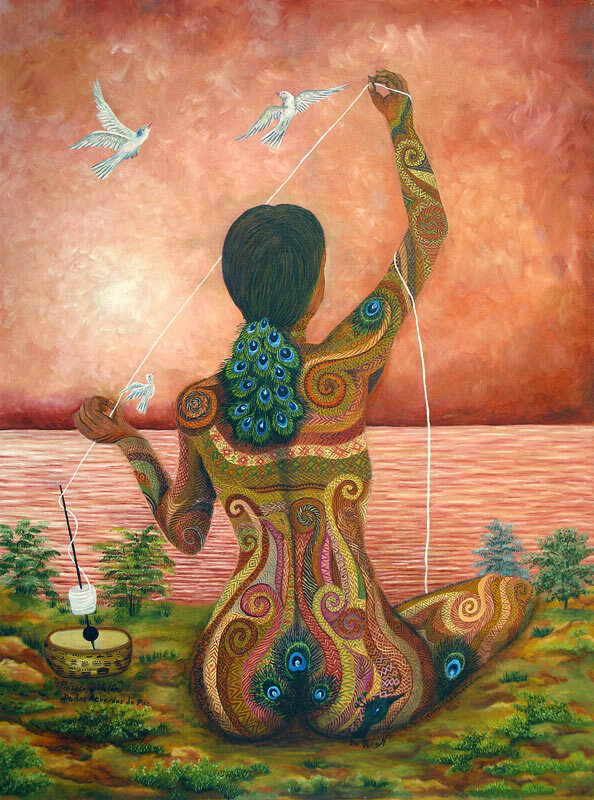 Lorenzo Cruz paints to communicate the spiritual and cultural traditions of his village and create a bridge from his culture that reaches out to other people. A collection of these beautiful and inspiring paintings will be on exhibit in Eagan on October 30, 2009.